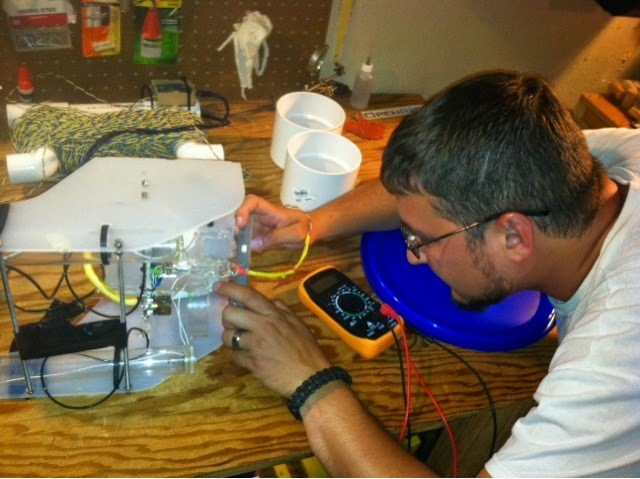 The ROV ran into some problems during the test dive that we didn't encounter at home. As James hinted, there were some electrical shorts that we didn't previously notice or check for. Things had been going pretty well up to this point and it is only now that we realize the vast amount of effort required to make this thing go. 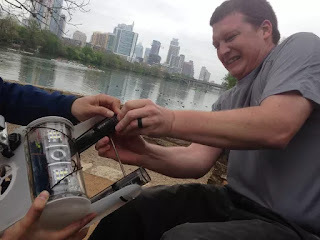 First, we discovered that the motors leak power into the water on all leads. Maybe some level is okay but we think that our readings were too high. James happened to have a perfect water test tank. It was a 5 gallon bucket from a project that had holes cut in the side. These holes allowed us to bring the ROV connector outside of the bucket for poking and prodding. 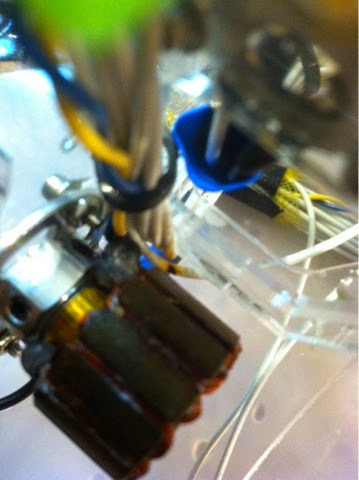 See that tiny brown mark next to the motor? One of the wires in the harness was routed incorrectly. This put it too close to the motor bell and caused it to get sliced up. We think this might be wicking water into the battery tube causing the moisture that we observed. Hopefully we can fix that with a solder, hotglue and heatshrink (SHH) fixture. 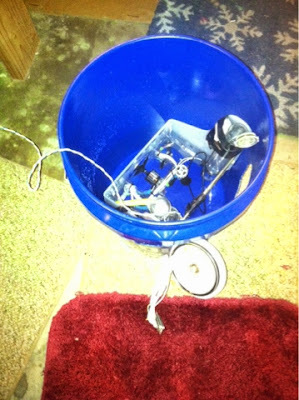 In hindsight we could (should) have tested our motors submerged in water before potting the harness into the main tube. This way we could have tried a few times and made sure the wires were all sealed and long enough after being cut several times. In any case it needs to come all the way apart and fortunately there is a small loop of extra wire for the entire harness. That will give us some slack to try fixing the seals on the motor solder joins. All nine motor wires need to be repaired, we think. The only external wires that passed the continuity test go into the IMU, indicating maybe the motors are the problem and not the SHH joints.